The collegiate chapter of the National Association for Music Education at IU (see their blog!) recently participated in the music advocacy groundswell event (found here) by collecting stories from children about why music matters to them. They made efforts to contact public school teachers in the greater Bloomington area and reached out to the teachers from their hometowns. They ended up collecting nearly 18,000 words worth of inspirational stories of how music has played an essential role in kids’ lives across the country. The comments the children made are powerful to say the least… they speak of many benefits of music that we, as musicians and teachers, know to be true – finding a place to belong, uncovering a special talent, learning about themselves, developing a means of self-expression, bringing them closer together with friends and family, connecting to a greater community, music as a release and a joy, the acquisition of skills and dispositions that are benefits in other areas of life, etc. I am interested in research that addresses policy issues, generally, and music education advocacy, specifically. One of my recent objectives was to complete a study that would help music educators zero in on the types of influences that could be most powerful for preserving the conditions which allow students such as those who wrote the stories described above to continue to have the opportunity to benefit from school music. I conducted a study of the National Center for Educational Statistics’ surveys of Arts Education in the Elementary and Secondary Schools to determine what types of school conditions may be most indicative of support for the arts. The data from these surveys are representative of all public schools in the USA. Using prediction models, I examined the relationships between the reported adequacy of funding, instructional time, and number of arts-specialist teachers and school-level support factors such as: (1) the number of arts events at the school, (2) whether the principal attends arts events, (3) the degree of student interest in the schools’ arts programs, (4) the degree of parent/community support of the schools’ arts programs, (5) whether the school included the arts in their mission statement, (6) whether arts specialists were included on site-based management teams, (7) whether there was an arts curriculum specialist coordinating the program, and (8) whether arts grades were in included in students’ cumulative GPA. The published article can be found here: Miksza (2013). Arts Education Advocacy: The Relative Effects of School-Level Influences on Resources for Arts Education. Arts Education Policy Review, 114, 25-32. Or, if you’re interested, email me and I’ll send you the research. The chief results of this study are fairly clear. 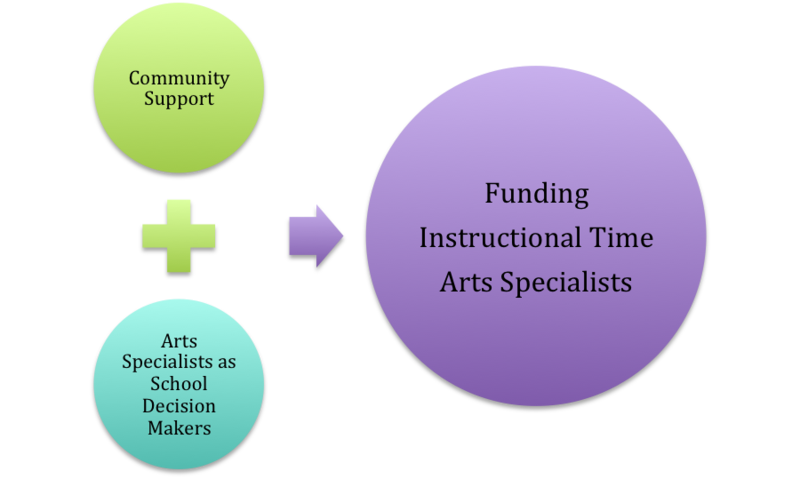 Those schools who enjoyed greater degrees of parent/community support and included arts specialists on site-based management teams were also more likely to report more robust resources in regards to funding, instructional time, and arts-specialist teachers. These general predictive relationships held for both, elementary and secondary schools as well as across schools that varied according to community type (e.g., rural, town, suburban, urban), poverty level (e.g., % free or reduced lunch), and student minority status. Overall, these findings stress the potential benefit of integrating what happens in arts education within school boundaries with what’s happening outside (i.e., arts in the community, rallying parent support). The results also highlight the value of having arts specialists participate in school-level administration and decision-making processes. The take away of this research for teachers and arts education advocates is to be mindful of ways that school arts programs can be relevant and integrated within the school’s greater community and to be sure to “have a seat at the table” when important decisions are being made.